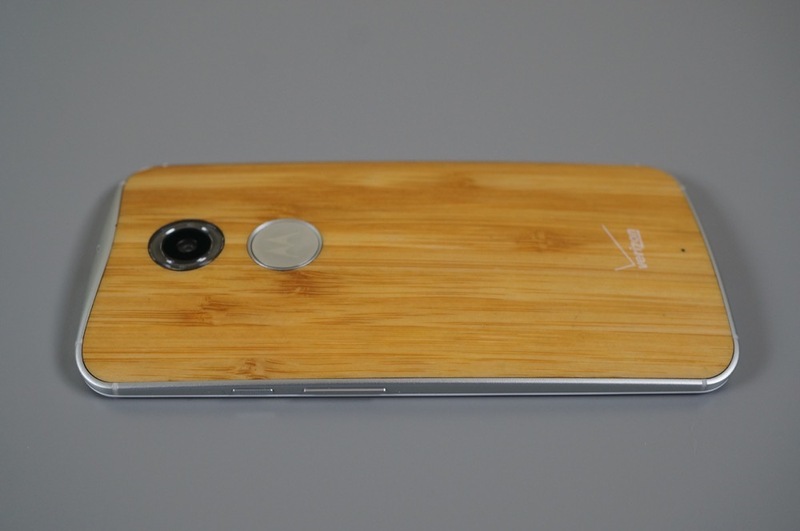 The Moto X (2nd gen) on Verizon is indeed receiving an update to Android 5.0 “Lollipop” this week. 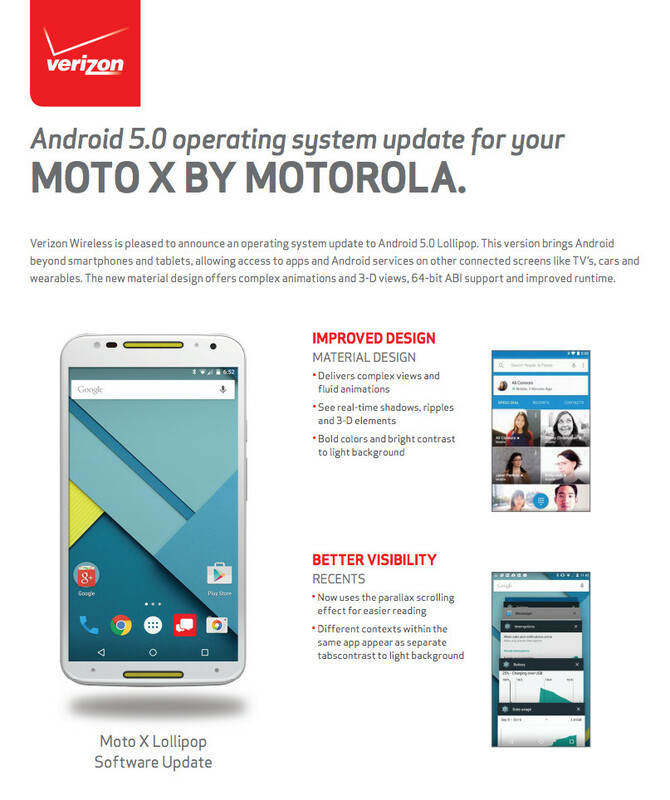 Well, a soak test of the software update is rolling out to members of Motorola’s Feedback Network as I type this, but assuming it goes well, the rest of the world of Verizon Moto X (2nd gen) owners should have it before long. Update: Some non-soak testers are reportedly receiving the update as well. Head into Settings>About phone>System updates to check! We were able to track down the full changelog for the update, which drops in as 22.21.11, in case you are keeping track. As expected, the update includes a “pure” version of Android to showcase Google’s take on the latest in Material Design and features. You will find the new app switcher, lock screen, notifications, do not disturb mode (“Interruptions), flashlight shortcut in the quick settings menu, app pinning, and switch to ART Runtime. Of course, the Moto suite of apps like Moto Display are still there, but Motorola is now allowing you to choose between Moto Display or Google’s Ambient Display. You will quickly notice a whole new colorful look and feel to your device – from fluid animations to new application and system themes, colors and widgets. You can tailor how interruptions behave, choosing to allow all, none, or only priority interruptions. You can personalize what counts as a priority interruption (reminders, events, calls, messages) and even tailor them to be from only contacts you specify. The Downtime setting will allow only priority interruptions during the times and days that you specify. e.g. allow only priority interruptions on the weekend. The redesigned Overview space (formerly called Recents) will include both applications and separate activities within those applications. For instance, each open tab in Chrome will also appear here along with recent applications; both your Gmail Inbox and a draft email message will appear as separate cards. This provides a consistent way to switch amongst tasks. While your phone’s display is off, Moto Display will continue to surface relevant notifications to you using the low-power Contextual Computing Processor. It will also intelligently react when you use the Approach gesture under Moto Actions. 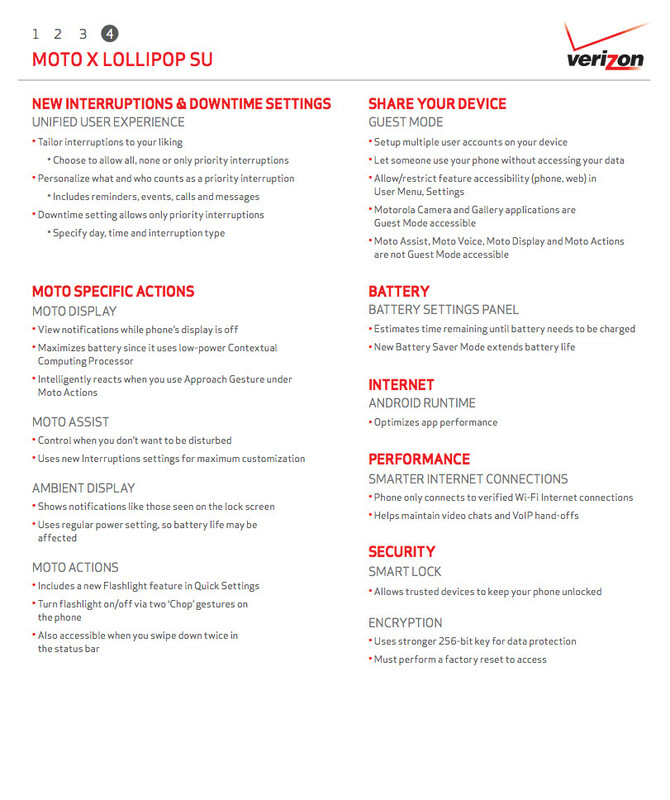 Motorola Assist integrates the new Downtime settings to control when you don’t want to be disturbed. Motorola Assist also now uses the new Interruptions settings so that you can customize exceptions, such as letting only people on your starred contacts list get through. Lollipop includes a new flashlight option as part of Quick settings (swipe down with two fingers from the status bar to see it). You can now set up multiple user accounts on your phone. Guest mode is enabled by default. You can give calling and text privileges to other users of your device, or restrict them as you like in the Users menu under Settings. Screen pinning allows you to keep a specific app or screen in view. For example, you can ‘pin’ a game and your child will not be able to navigate anywhere else on your phone. The Battery settings panel now shows an estimated projection for how much time you have left while discharging or charging. You can also enable a new battery saver mode that will save power by reducing performance and most background data operations to extend your battery life. With Android Lollipop, your phone will not connect to a Wi-Fi access point unless there is a verified Internet connection. This feature improves hand-offs between Wi-Fi and cellular connections, helping to maintain your video chat or voice-over-IP (VoIP) call as you switch. Your phone now uses the new Android Runtime to help optimize application performance. After upgrading to Lollipop, your applications will undergo a one-time optimization process. Note that the optimization for ART requires more space. Android Lollipop adds native support for allowing trusted devices to keep your phone unlocked (such as your Moto 360, a Bluetooth car kit or headset, etc.). 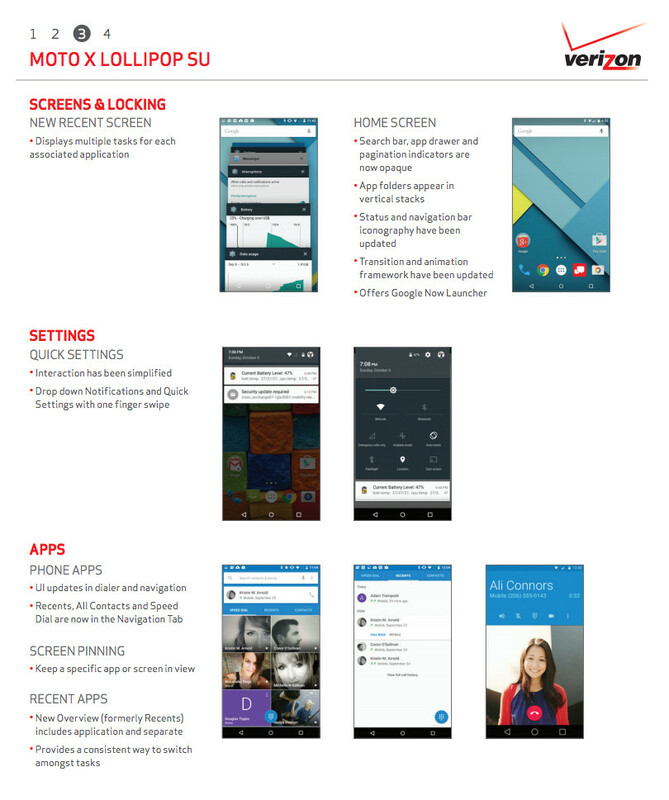 Smart Lock replaces the prior trusted device capability in your Motorola phone. Note that you will need to add your trusted devices back after the transition to Lollipop in the Security settings menu under Smart Lock. The update weighs in at a cool 678.6MB, so make sure you have plenty of battery life if you are prompted to download and update. This is a big one. On a related note, we are not seeing a mention of Verizon’s Advanced Calling 1.0, which not only brings voice-over-LTE, but simultaneous voice and data. 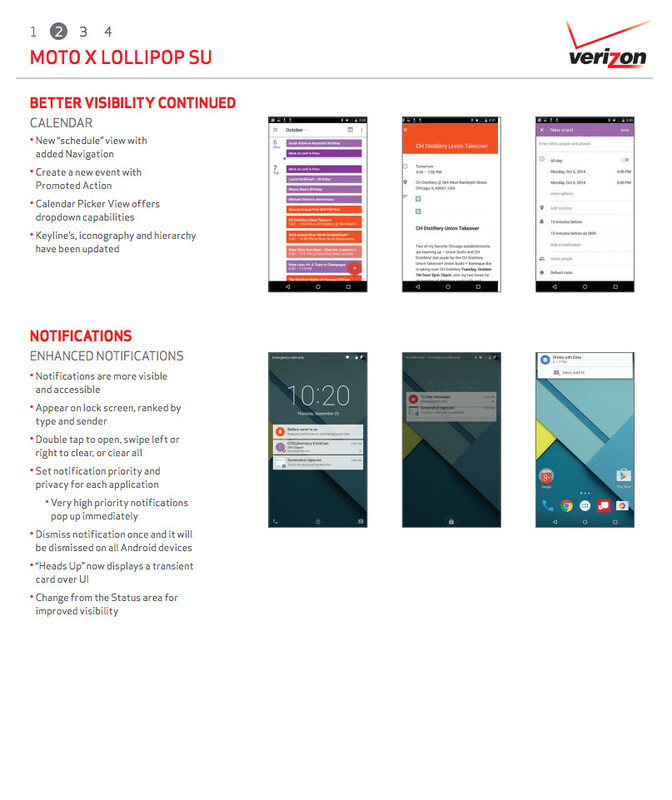 Maybe Verizon’s changelog will include it. Update: Verizon has confirmed that it is rolling out to all. Also, here is their changelog; no VoLTE or Advanced Calling 1.0 mentioned. Cheers T, D, R, and J!